This study investigates the appropriateness of ‘Team up! ''- a course book designed to teach English as a foreign language (EFL) - for dyslexic learners. It focuses on the theory that lies behind the field of dyslexia and the instruction of EFL and sheds light upon the authors'' intentions regarding mixed ability classes and students with dyslexia. 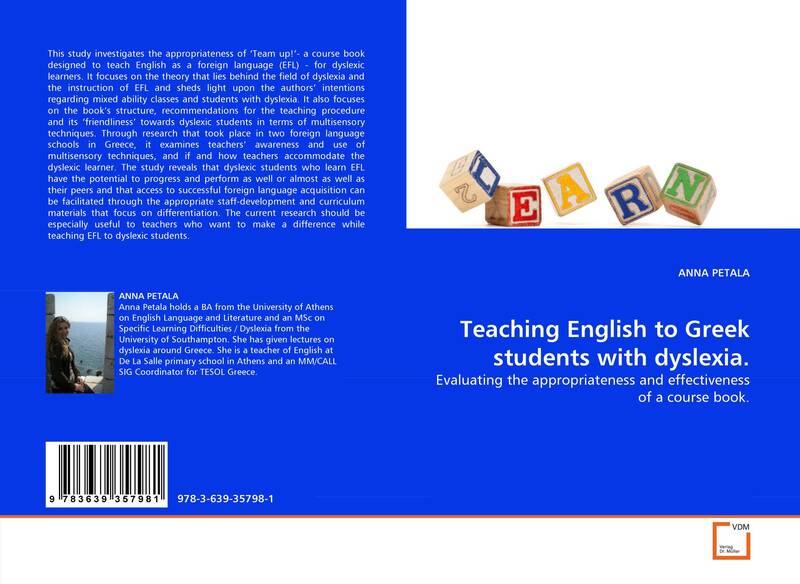 It also focuses on the book''s structure, recommendations for the teaching procedure and its ‘friendliness'' towards dyslexic students in terms of multisensory techniques. Through research that took place in two foreign language schools in Greece, it examines teachers'' awareness and use of multisensory techniques, and if and how teachers accommodate the dyslexic learner. The study reveals that dyslexic students who learn EFL have the potential to progress and perform as well or almost as well as their peers and that access to successful foreign language acquisition can be facilitated through the appropriate staff-development and curriculum materials that focus on differentiation. The current research should be especially useful to teachers who want to make a difference while teaching EFL to dyslexic students.